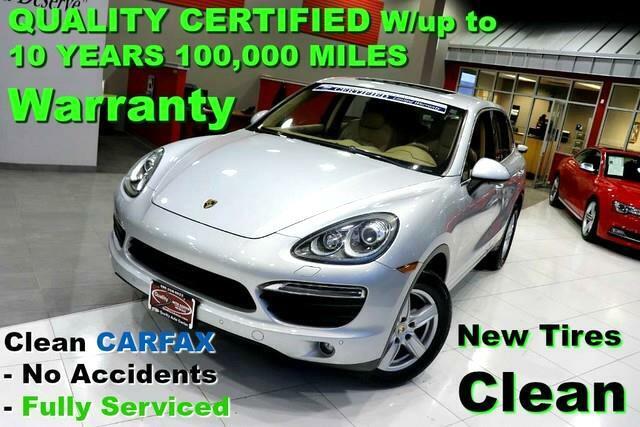 Clean CARFAX - No accidents - Fully Serviced - QUALITY CERTIFIED up to 10 YEARS 100,000 MILES WARRANTY 2011 Porsche Cayenne S 4.8L DOHC V8 - Clean Carfax - No accidents - Fully Serviced - QUALITY CERTIFIED up to 10 YEARS 100,000 MILE WARRANTY with 69,923mi. This Porsche includes: REVERSING CAMERA W/PARKASSIST FRONT AND REAR Rear Parking Aid Back-Up Camera PREMIUM PKG Navigation System Seat Memory Auto-Dimming Rearview Mirror Rear Parking Aid Power Passenger Seat Power Driver Seat Heated Front Seat(s) HID headlights Active Suspension BI-XENON HEADLIGHTS Automatic Headlights HID headlights PORSCHE COMMUNICATION MANAGEMENT (PCM) Navigation System CD Player AM/FM Stereo CD Changer Premium Sound System Hard Disk Drive Media Storage MP3 Player WALNUT HEATED THREE-SPOKE MULTI-FUNCTION STEERING WHEEL Adjustable Steering Wheel LUXOR BEIGE, FULL LEATHER SEAT TRIM Leather Seats NON-SMOKER PKG XM SATELLITE RADIO Satellite Radio CLASSIC SILVER METALLIC 18-WAY PWR ADAPTIVE SPORTS SEATS W/MEMORY Seat Memory Adjustable Steering Wheel Passenger Adjustable Lumbar Driver Adjustable Lumbar *Note - For third party subscriptions or services, please contact the dealer for more information. * CARFAX shows that this is a one-owner vehicle -- no wonder it's in such great condition. The Porsche Cayenne S 4.8L DOHC V8 - Clean Carfax - No accidents - Fully Serviced - QUALITY CERTIFIED up to 10 YEARS 100,000 MILE WARRANTY offers a fair amount of utility thanks to its advanced features and unique styling. It's also quite sporty, and injects an ample amount of handling chutzpah into the ridin'-high body of a family-friendly SUV. This Porsche Cayenne S 4.8L DOHC V8 - Clean Carfax - No accidents - Fully Serviced - QUALITY CERTIFIED up to 10 YEARS 100,000 MILE WARRANTY is for the discerning driver who demands the utmost of his vehicle. This Porsche Cayenne features AWD. That means power and control delivered to all four wheels for maximum grip and improved handling. You can tell this 2011 Porsche Cayenne has been pampered by the fact that it has less than 69,923mi and appears with a showroom shine. Added comfort with contemporary style is the leather interior to heighten the quality and craftsmanship for the Porsche Cayenne You can take the guesswork out of searching for your destination with this Porsche Cayenne S 4.8L DOHC V8 - Clean Carfax - No accidents - Fully Serviced - QUALITY CERTIFIED up to 10 YEARS 100,000 MILE WARRANTY's installed Navigation system. How often was the oil changed? Were important service intervals taken care of? You'll have the records on this vehicles to know for sure. Clean interior? How about flawless. This Porsche Cayenne looks like has never been used. The perfect balance of speed and control has been injected into this 2011PorscheCayenne. This impeccably built Porsche Cayenne S 4.8L DOHC V8 - Clean Carfax - No accidents - Fully Serviced - QUALITY CERTIFIED up to 10 YEARS 100,000 MILE WARRANTY comes with a plethora of added features that have made this vehicle a unique find. These options will simply amplify the experience of owning and driving this wonderfully crafted Porsche. You'll enjoy improved traction and world-class handling thanks to the new tires on this vehicle. This car enjoys a laser-perfect paint finish. Sophistication, performance, style and class all wrapped up in this rare Porsche Cayenne. More information about the 2011 Porsche Cayenne: The Porsche Cayenne represents the ultimate in SUV performance and capability. All are agile, quick, able handlers that rival many sports cars, but also offer the versatility of being able tow between 6,000 and 7,700 pounds. With four trim levels available--Base, S, Turbo and S Hybrid--there's a Cayenne to suit all enthusiasts in the range from mild to wild. With a base price of just $46,700, getting into a Cayenne rather than a BMW or Mercedes-Benz SUV is a real option. Strengths of this model include high people carrying and cargo capacity, excellent handling, Several powerful engine options, and luxurious interiors No Credit / Bad Credit / No Paystubs, No problem !! ! All Approved ! Everyone drives ! CLEAN, GORGEOUS, LOW MILES, SHOWROOM CONDITION. CALL NOW QUALITY CERTIFIED up to 10 YEARS 100,000 MILE WARRANTY , To Certify a vehicle, there will be an additional cost for Certification. CALL NOW For details. STUNNING AGGRESSIVE LOOK ON THIS BEAUTIFUL--Call today to schedule a test drive... Good Credit/Bad Credit/No problem!!!! Get paid cash? No problem!! 100% Credit Approval with interest rates starting at 2.49% for qualified customers, our rates will not be beaten. We price our cars at wholesale price to guarantee the best deals for our customers. Our inventory moves quick, please call to confirm the availability of the vehicle of your interest Springfield location 973-564-0112. This vehicle is located at our SPRINGFIELD location. Come visit our new showroom in Springfield NJ. Thank you for visiting another one of Quality Auto Center's online listings! Please continue for more information on this 2011 Porsche Cayenne S with 69,850mi. Want more room? Want more style? This Porsche Cayenne is the vehicle for you. Is it possible to fall in love with a vehicle? It is when your vehicle is as prestige as the Porsche Cayenne. Simply put, this all wheel drive vehicle is engineered with higher standards. Enjoy improved steering, superior acceleration, and increased stability and safety while driving this AWD PorscheCayenne S. One of the best things about this Porsche Cayenne is that it has low, low mileage. It's ready for you to truly break it in. Added comfort with contemporary style is the leather interior to heighten the quality and craftsmanship for the Porsche Cayenne More information about the 2011 Porsche Cayenne: The Porsche Cayenne represents the ultimate in SUV performance and capability. All are agile, quick, able handlers that rival many sports cars, but also offer the versatility of being able tow between 6,000 and 7,700 pounds. With four trim levels available--Base, S, Turbo and S Hybrid--there's a Cayenne to suit all enthusiasts in the range from mild to wild. With a base price of just $46,700, getting into a Cayenne rather than a BMW or Mercedes-Benz SUV is a real option. Strengths of this model include high people carrying and cargo capacity, excellent handling, Several powerful engine options, and luxurious interiors No Credit / Bad Credit / No Paystubs, No problem !! ! All Approved ! Everyone drives ! CLEAN, GORGEOUS, LOW MILES, SHOWROOM CONDITION. CALL NOW QUALITY CERTIFIED up to 10 YEARS 100,000 MILE WARRANTY , To Certify a vehicle, there will be an additional cost for Certification. CALL NOW For details. STUNNING AGGRESSIVE LOOK ON THIS BEAUTIFUL--Call today to schedule a test drive... Good Credit/Bad Credit/No problem!!!! Get paid cash? No problem!! 100% Credit Approval with interest rates starting at 2.49% for qualified customers, our rates will not be beaten. We price our cars at wholesale price to guarantee the best deals for our customers. Our inventory moves quick, please call to confirm the availability of the vehicle of your interest Springfield location 973-564-0112. This vehicle is located at our SPRINGFIELD location. Come visit our new showroom in Springfield NJ.